A map can tell a story, particularly, when strategic locations all point to one common denominator. In this case, a nation — Iran, and the specific Muslim sect, Shia Islam, that comprises 90% of its population. Check the map and those locations colored in orange, all of which have been significantly influenced by Iran or have announced publicly to be an ally of Iran. Does Bible prophecy in the end-of-days reveal a nation or group, the characteristics of which, Iran (and Shiism) fulfills? If so, believers need take notice. The Scriptures tell us — God will not initiate matters of importance without first informing His prophets, and they, His people. Amos 3:7 NASB Genesis 18:17 NASB Psalms 25:14 NASB. Iran is also one of the few Middle East countries that poses a nuclear threat to the Middle East. Although Iran’s public threats are focused on “wiping Israel off the face of the map,” Iran is by no means an ally of Arab countries making up the Gulf Cooperation Council (Bahrain, Kuwait, Oman, Qatar, Saudi Arabia, and the United Arab Emirates), of which Saudi Arabia is the key player and which recently formed a unified military command for the first time in its thirty-two year history. The formation of the unified military command should be seen as significant. Why would Saudi Arabia initiate such an effort unless its fickle ally, America, was no longer seen as a stable source of dependable security? Quite clearly, to Iran and others of its allies such an action on the part of its Sunni adversary must have been perceived with distrust. Iran could potentially share its nuclear technology and know-how with extremist groups hostile to the United States and the West. … The U.S. Department of Defense reported in April 2012: “With sufficient foreign assistance, Iran may be technically capable of flight-testing an intercontinental ballistic missile by 2015.” Many analysts are also concerned about the possibility of a nuclear weapon arriving in a cargo container at a major US port. Furthermore, a federally mandated commission to study electromagnetic pulse (EMP) attacks noted the vast damage that could be wrought by a single missile with a nuclear warhead, launched from a ship off the US coast, and detonated a couple of hundred miles in the air, high above America. 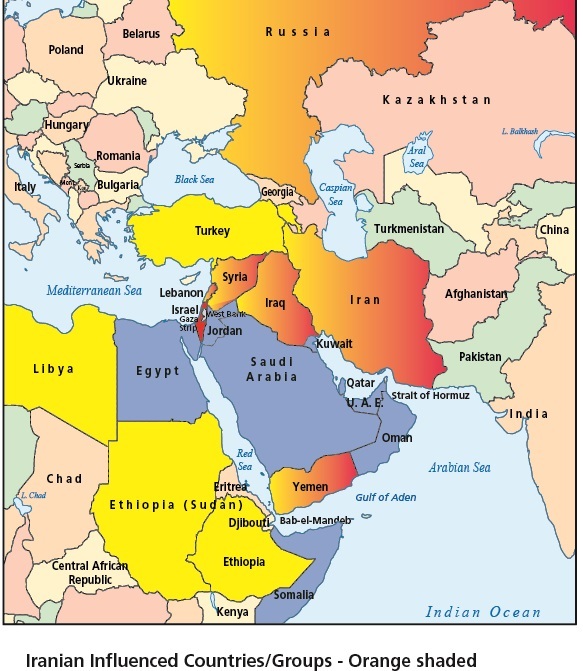 The opening map reflects Iran’s influence in the Middle East. But as one might suspect, influence has a cost, a financial cost. Insurgents (including Syria’s Bashar al-Assad) have to be armed, fed, and compensated. Hezbollah in Lebanon, HAMAS (Sunni, and of late, not as clear an ally because of Bashar al-Assad in Syria) in the Gaza Strip, al-Houthis in Yemen, all have budgets that enable them to combat Israel or Sunni insurgents whether soldiers with the Islamic State or Al-Qaeda. Once the cost of basic necessities is funded, religion (Islam) can be the motivator for loyalties. What happens if the economy of Iran is squeezed so tightly that it cannot continue the cost of its many “tentacles of terror”? Iran’s crude oil production fell dramatically in 2012, following the implementation of sanctions in late-2011 and mid-2012. Iran dropped from being the second-largest crude oil producer in OPEC to the fourth in 2013, after Saudi Arabia, Iraq, and narrowly behind the United Arab Emirates (UAE). Iran’s production increased in 2014, increasing Iran’s rank to the third-largest crude oil producer in OPEC during the first half of 2014. Since June, 2014, the price of crude oil has fallen by 50% to its most recent close at $56 per barrel. If oil remains at this reduced level, the impact on Iran’s economy and its financial capability to fund its Middle East terror tentacles will become possible only as something else is impacted. According to the U.S. Energy Dept statistics for 2012, Iran is #8, Iraq is #5, and Russia is #2 on the world’s list of net oil exports. 2. Iraq is Arab, and 95% Muslim. Iraq is a majority Shia Muslim country (65%), bordering Iran’s western border, and includes two significant holy cities for Shias, Najaf and Karbala. Iran is allied with Shia Muslims in Iraq. Prime Minister Nouri al-Maliki, Shia Muslim, resigned on 8/14/2014 after being accused of Shia favoritism by Sunnis for years. It is a well-publicized fact that Iran ships military supplies over Iraqi air-space to Syria to support the efforts of President Bashar al-Assad of Syria. The Islamic State (Sunni Salafist Islamist) presently has control over the northern regions of Iraq and the southern regions of Syria and has advanced its Islamist militias to north of Baghdad, the capital of Iraq (Shias in Iraq populate most of southern Iraq). The Islamic State has not been able to overcome the Shias of Iraq nor the Kurds of Kurdistan northern Iraq (Mosul). Iran’s influence in Iraq has been through Shia Muslims in positions of government authority, although Iran has publicly voiced support of Iraq regardless of which sect of Islam is in control of the country. 3. Syria is Arab. Syria is a majority Sunni (60%) Muslim country although Syria’s current president is Bashar al-Assad, an Alawite Shiite, a branch of Twelver Shiism (Iran is Twelver Shia). Alawite Shias hold most of the important government positions in Syria even though only 13% of the population is Shia Muslim. Iran has supported Syrian President Bashar al-Assad and has provided funding for its military operations. According to Al Monitor, Iranian influence has extended the resources of Hezbollah into Syria which, according to some, have literally kept al-Assad in office. Syria is not a major exporter of petroleum products. Hezbollah continues to define itself primarily as a resistance movement and remains viscerally opposed to what it views as illegitimate U.S. and Israeli intervention in Lebanese and regional affairs. It categorically refuses to recognize Israel’s right to exist and opposes all concluded and pending efforts to negotiate resolutions to Arab-Israeli disputes on the basis of mutual recognition, including the Israeli-Palestinian conflict. Hezbollah is a significant terror tentacle of Iran. 5. Al-Houthis of Yemen. Yemen is located on the southern most tip of the Arabian Peninsula. In recent days, a Shi’ite group called the “Houthis” have overrun Sana’a, the capital of Yemen. Houthis belong to the Zaidi branch of Shia Islam, also known as Fivers, a sect of Islam almost exclusively present in Yemen. The former president of Yemen, Ali Abdullah Saleh, and his political party, the General People’s Congress was overthrown from office in the Arab Spring of 2012. The Houthis became the de facto power in Western-allied Yemen when they captured Sana’a in September. 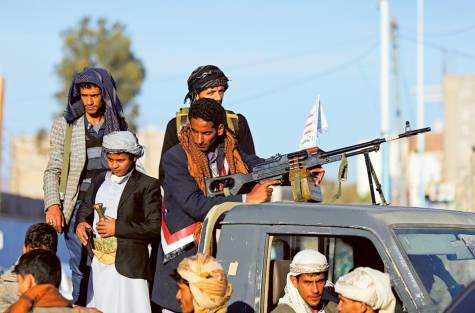 The Houthis are expanding their control in Yemen by attacking and controlling government locations and facilities. The Houthis are opposed by Yemen based al-Qaeda of the Arabian Peninsula, a Sunni Salafist organization (AQAP). According to the National Counterterrorism Center, AQAP has orchestrated numerous high-profile terrorist attacks. Its former leader was dual US-Yemeni citizen Anwar al-Aulaqi, who had a worldwide following as a radical ideologue and propagandist. He was killed in an explosion in September 2011 led by the United States. AQAP is located in northeast sections of Yemen. Al-Houthis are located in the northwest of Yemen and the capital city, Sana’a. (Reuters) – Iran has supplied weapons, money and training to the Shi’ite Houthi militia that seized Yemen’s capital in September, as Tehran steps up its regional power struggle with Saudi Arabia, Yemeni and Iranian officials say. … Sunni countries in the Gulf accuse Iran of interference via Shi’ite proxies in the region, something Tehran denies. … But Reuters has details — from Yemeni, Western and Iranian sources — of Iranian military and financial support to the Houthis before and after their takeover of Sanaa on Sept. 21. Russia. Russia is a superpower nation that has aligned itself with just about everything that America stands against, including Iran. Iran is a long-standing ally of Russia. That said, the two allies are not without opposition to one another. Russia recognized United Nations economic sanctions against Iran when it cancelled its contract with Iran for the sale of its renowned S-300 missile defense system in response to Iran’s nuclear ambitions. Iran retaliated by filing suit against Russia for violation of the contract. Both Russia and Iran have supported Syria’s President Bashar al-Assad. With Russia’s annexation of Crimea, economic sanctions were implemented by the United Nations which have impacted the Russian economy. With the plunge of oil and gas prices, the Russian economy has been further impacted as has the Russian ruble. Last week, the Russian Central Bank increased its rate from 10.5% to 17% in an effort to prop up the ruble which has lost 50% of its value against the U.S. dollar in the last six months. Recently (October 2014), the economic development minister of Russia reported that Russia’s economy could fall into recession in 2015 if oil prices fell below $60 a barrel and remained there for any length of time (price on 12/19/14 was $56 barrel). The United States Department of Energy reported that the sale of oil and gas exports amounts to 68% of Russia’s 2013 export revenue. The BBC reports that the Russian economy will lose $2 billion in revenues for every $1 drop in crude oil prices. The oil and gas crisis for Russia is further complicated by the decision of OPEC not to prop up the price of crude oil by cutting production (led by heavy weight, Saudi Arabia) as it has done before. Hence, the fall in prices is likely to remain at this level for some time unless something happens globally to change this. Winners and losers of the drop in price of barrel of oil? The world’s largest net oil importers are the winners and the world’s largest net oil exporters are the losers. Read more. Read more. America is the world’s #1 importer. The world largest exporters are: Saudi Arabia (#1), Russia (#2), Iraq (#5), and Iran (#8). American consumers (and consumers the world over) are being paid back the trillions taken out of their pockets since 1973 (compare Revelation 13:17:15 NASB). Saudi Arabia is the only one of the exporter group that has the reserves to withstand an extended price of $60 per barrel or lower (as do the other members of the GCC which round out the top 7). In fact, if you think about it, Saudi Arabia has a political reason to allow the price of oil to continue to fall. Oil as a sword. It would not be the first time that Saudi Arabia has used oil as its political sword. The time many remember was in the 1973 Oil Crisis when the price of oil was $3 per barrel. The Arabs (and OPEC) retaliated against the West when America supplied arms to Israel that were used against the Arabs in their attempt to regain lands lost in the 1967 Six-Day War. The success of the embargo established the usefulness of oil as a political and economic sword that none could withstand for long. Let us suppose that once again OPEC has unleashed its sword. This time not against the West but against Iran and its allies. Read more. The sword will have the same impact on Iran and its allies that it had upon the United States and its allies. Why should Saudi Arabia manipulate the market price of oil by decreasing its production? To do so reduces world supplies which increases the market price of oil. It is in the political interests of the Saudis for the prices to continue to fall. As the price falls, the sharp blade of its sword begins to destroy its adversaries, in this case, Iran, Iraq, and Russia. Saudi Arabia need never lift a literal sword against its enemies. Their economies will suffocate and with the economic suffocation so will the leaders of Iran and her allies. All the Saudis have to loose is a little extra cash that has long since lost its usefulness to the Royal family. Saudi Arabia is playing politics with oil, forcing Opec to maintain its current production levels at 30m barrels per day, to force down the price. … Many experts talk of a Cold War between Saudi and Iran, where on every major issue of regional concern an Iranian gain is viewed by the Saudis as a loss, and for the House of Al Saud alarm bells are ringing. In their view the US has effectively caved in, and allowed Iran off the hook. Iran, Iraq, and Russia are very quickly being brought to their knees. Combined with economic sanctions, Russia will no longer be a superpower but rather a bankrupt economy ripe for the taking. At what point will Iran and Russia force chaos so that its economic death will be prevented and the sword averted from their neck? 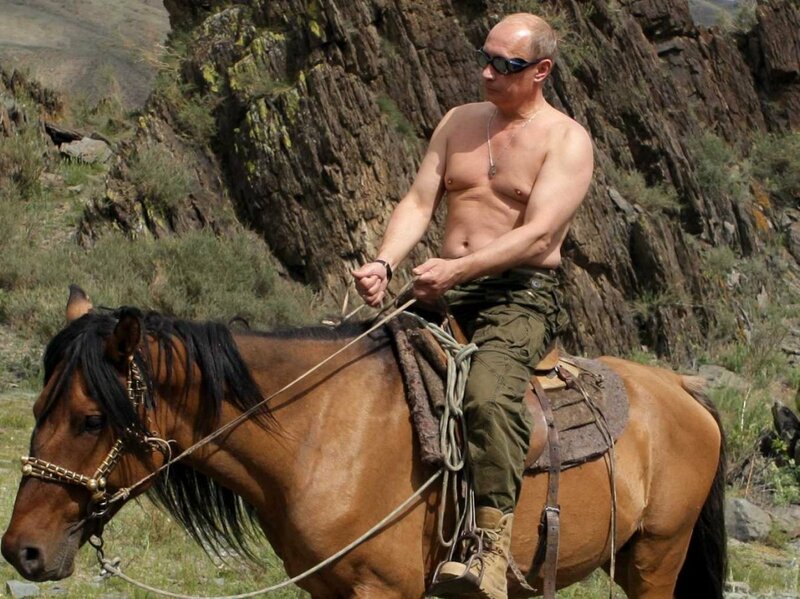 For some reason, I can’t see Vladimir Putin, the only president in the world that poses shirtless riding horses over the Russian countryside, throwing up a white flag. I can’t see the Ayatollah Khameini, the Supreme Leader of Iran, surrendering to the power of the Sunnis of the House of Saud just like his ancestors did so many times in the past. Rather, it will be time for the Ayatollah to “rise up” Muhammad al-Mahdi, the long-awaited one of Shiism to avenge the wrongs of the Sunnis committed thereupon since 680 AD. In fact, I would go far as to say that the lower the price of oil falls, the more likely the scenario just painted. Overcome Saudi Arabia and you have taken the sword out of the hand that holds it. As to why Iran is a key player, we must look to Shiism. It is Shiism that identifies the aggressor nation against the harlot in the end-of-days. Revelation 17 defines the harlot. Daniel 2 defines Shiism. Read this post if you want the biblical support that distinguishes Shiism in the end-of-days. As to why Saudi Arabia is the harlot, you need read chapter 10 of my book here. The further the fall in the price of oil, the closer we are to the end-of-days. P.S. Merry Christmas; and, so sweet to finally write another post. So sweet to read another post. Merry Chrisas Dr Jack! Lessing in Christ to you and yours. Let me try this again from a real keyboard —– So sweet to read another post. Merry Christmas Dr. Jack! Blessings in Christ to you and yours. Always good to hear from you, Mike. And thanks for the check-in email you sent me a few days back. It is good to be missed! Another awesome read! Thanks, again, for your perspective on all these events. I appreciate the effort you put into your research and your willingness to share it. Thanks, Penny. May God bless us in 2015. I sense a time of unparellelled spiritual activity. As the rage of anger and darkness continues its advance, the light will be equally as bold. Great perspective. Please change the font color of the first footnote. Hard to read against a gray background. Thanks TM. Also, I have reset the color of the footnotes. Let me know if you have other suggestions.